Like much of the River Welland, the stretch that runs adjacent to the village of Ashley has been heavily canalised. This has removed the natural form of the river channel resulting in slow flows that deposit silt, choking habitat for aquatic wildlife. Surveys carried out by the Environment Agency have shown that very few fish are found here and that the invertebrate populations are equally low. The key issues this project will address are biodiversity and river channel morphology. 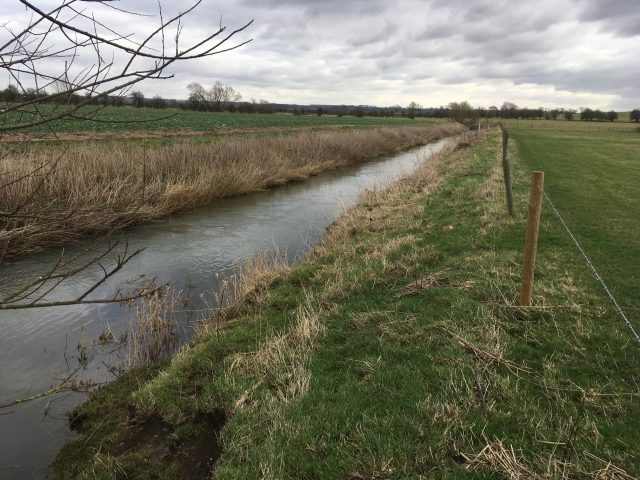 This section of the River Welland has previously been the target of restoration by the Environment Agency, so this project was designed to enhance and build upon this. Canalised Welland at Ashley pre-project. Improvements to canalised section post-project. A suite of in-channel improvements were delivered during Autumn 2018. These included the regrading of the steep north facing bank to reduce the gradient from the edge of the field down to the river. 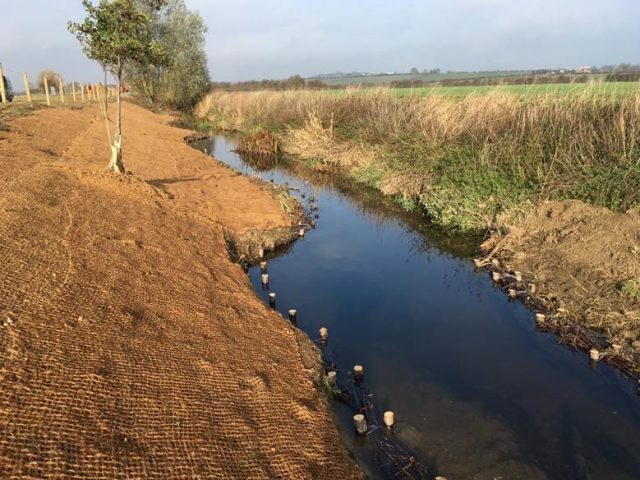 This will allow more light onto the bank, promoting the growth of native marginal plant species which will reduce bank erosion and provide wildlife habitat. A series of berms were created within the straightened section, narrowing the channel and reintroducing small meanders to the river – this increases flow speed to prevent siltation. 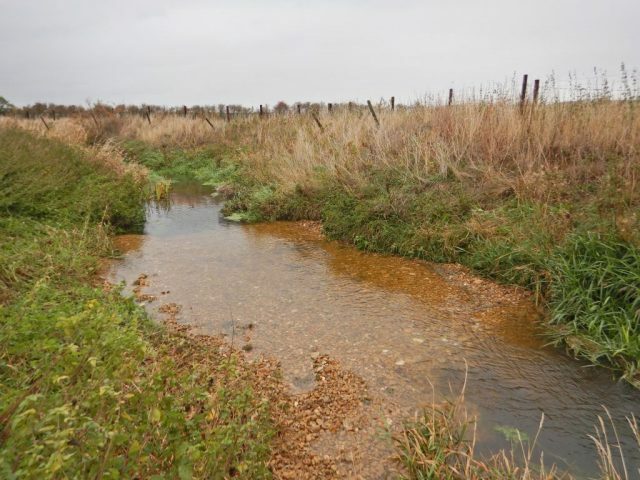 Elsewhere, gravel was introduced at strategic points to raise the level of the river bed and create fast flowing riffles.Introducing more oxygen to the water creates helps to create ideal habitat for aquatic invertebrates and for trout to spawn in. To assess the improvements made during this project, a survey programme has been developed. 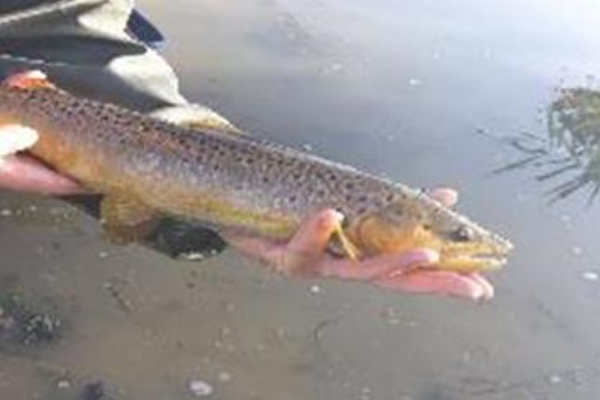 Two fisheries surveys were carried out in 2018 before the work had taken place and showed small numbers of brown trout, chub, dace and other minor species. The next survey is scheduled for May 2019 and will reveal whether abundance of these species has increased as a result of the work. An invertebrate survey was also undertaken in November 2018 and will be repeated annually.